Definition at line 36 of file status-dataset-context.hpp. Definition at line 97 of file status-dataset-context.hpp. Definition at line 119 of file status-dataset-context.cpp. Definition at line 30 of file status-dataset-context.cpp. StatusDatasetHandler may change the prefix of Data packets with this method, before sending any response. The version component is optional, and will be generated from current timestamp when omitted. Definition at line 36 of file status-dataset-context.cpp. References ndn::Name::appendVersion(), ndn::Interest::getName(), and ndn::Name::isPrefixOf(). Definition at line 56 of file status-dataset-context.cpp. The response will be cached for the specified duration. Incoming Interest that matches a cached response will be satisfied with that response, without invoking StatusDatasetHandler again. Definition at line 62 of file status-dataset-context.cpp. Definition at line 69 of file status-dataset-context.cpp. 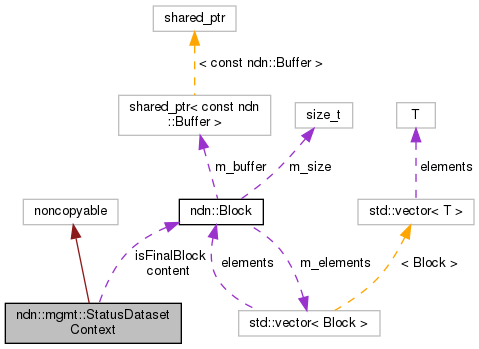 References ndn::tlv::Content, ndn::encoding::makeBinaryBlock(), ndn::MAX_NDN_PACKET_SIZE, ns3::ndn::Name, ndn::Block::size(), and ndn::Block::wire(). Definition at line 95 of file status-dataset-context.cpp. References ndn::tlv::Content, ndn::encoding::makeBinaryBlock(), and ns3::ndn::Name. This should be invoked when the incoming Interest is malformed. A producer-generated NACK will be returned to requester. Definition at line 109 of file status-dataset-context.cpp. Definition at line 104 of file status-dataset-context.hpp. Definition at line 95 of file status-dataset-context.hpp.